SKU: 889 Series. Categories: Shop All ThinLine Products, Endurance Saddle Pads, English Saddle Pads, Hunter Jumper Tack, Dressage Equipment, Horse And Rider Tack, Seat Makers, Rider Tack. Tags: close contact seat saver, dressage saddle seat saver, dressage seat saver, english seat saver, english trail saddle seat saver, jumping seat saver, seat maker. The ThinLine English Seat Maker is an incredible tool for your riding. It is so thin and effective you will forget it is there … until you take it off! 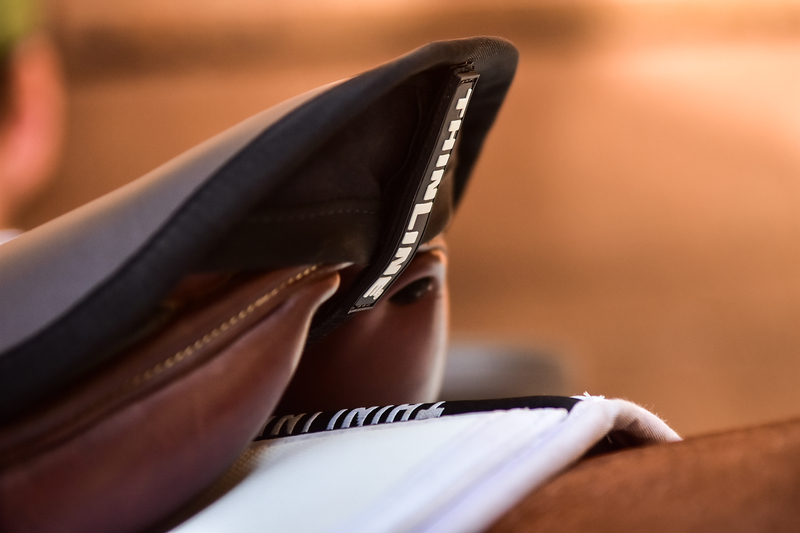 When we developed the ThinLine Seat Makers we thought they would be a great way for riders to discover just how much a ThinLine pad does for their horses. We had no idea, at the time, how much this little tack accessory would impact so many riders. Of course, protecting riders backs from the daily impact we experience is important but then we began hearing stories about how, with the seat maker, rider’s seats became so quiet and stable they were able to exponentially improve their equitation as well as their sense of security. Once removed for the show ring, riders have a new understanding of how still, sensitive and communicative they can be with their horses. Seat Makers are the thinnest of all ThinLine products. It is a fantastic way to see for yourself how so little can do so much, for both you and your horse. 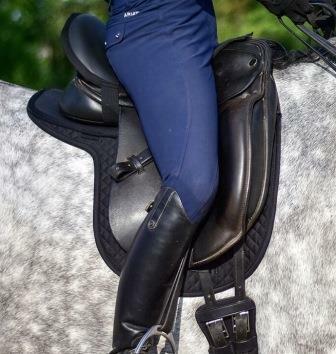 Riders who weigh 225 lbs and more as well as riders with significant back pain will experience optimal shock absorption with a combination of Seat Maker and Saddle Pad and we highly recommend these riders and their horses enjoy our products to the fullest. wow. it really worked for my friend love your stuff!!!! can you make the native american tack lighter? Carol Bell Landon: I use Thin line seat saver and saddle pad. The seat saver helps me “stick” to the saddle. The pad helps to raise the saddle a bit off the withers. Love all products and so does my horse Jack ! I can’t believe what a difference this pad makes! First of all it makes riding so much easier. I am able to ride for longer and can easily sit my huge Warmblood’s trot. His trot is so big it even throws me out of the saddle while posting normally. Not anymore with this pad! Secondly, I bought the ultra thinline back on track pad for my other horse who has a hyper sensitive back (chiropractor checked him out, he’s fine, just ultra sensitive) and the pad made a big difference in his overall relaxation…but I have NEVER – in the nearly 3 years I’ve owned him – been able to sit on his back at canter, only forward seat, half seat. As soon as he feels my seat even lightly in the saddle he drops his back down and takes off as fast as he can with ears pinned. Today, for the first time ever with this thinline seat saver, I was able to sit down on his back at the canter! He didn’t drop his back or run off, he accepted my seat aid and ROUNDED his back underneath me! It’s a miracle. I’m ordering a seconded one so that I have one on my dressage saddle and one on my jumping saddle. This same horse also had a problem with bucking up until now at the canter when his back would get tight. Today with the seat saver: No bucking! Not even when I took him over some low jumps. He was so comfortable he didn’t even spook at his usual place in the arena. These are big Warmbloods that I ride and I’m only 5’3” 120 lbs. This seat saver allows me to stay with the horse better and feel more solid in the saddle. It also keeps my leg quieter and solidly against the horse’s side. Plus it’s EXTREMELY comfortable and the horses move better underneath me with it. 5 stars! I wish I had tried this sooner. Thank you thinline. Bought a second seat saver for my dressage saddle because I love this for my jumping saddle. My horse has a tendency to spook frequently but I find that the seat saver keeps me in the saddle much more securely. When he spooks I no longer become unseated. It helps me to ‘stick’ to the saddle. It gets very hot in San Diego during the summer, so wearing full seat breaches can cause me to overheat. I’ve found that I no longer need my full seat breeches to feel secure in the saddle with this seat saver. Overall it helps me to be more relaxed during my ride and that transmits to the horse, so he stays more relaxed too. And if he does happen to spook, it seems like he doesn’t get such a jolt in the back from unseating me so he calms down and goes back to work much faster, relaxing more quickly. 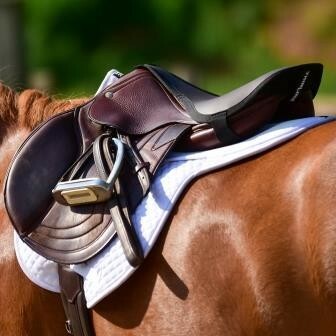 I use the seat saver on top of the saddle and the Contender II back on track thin line pad underneath the saddle. This seems to be a winning combination for my horses! It been a complete game changer for my riding and their performance. The description of this product is completely accurate. Before I purchased the seat saver, I was skeptical that something so thin could make riding so much more comfortable, but the difference is unbelievable. I feel much more secure in the saddle, and even though I have some back issues, I don’t have pain after riding anymore. 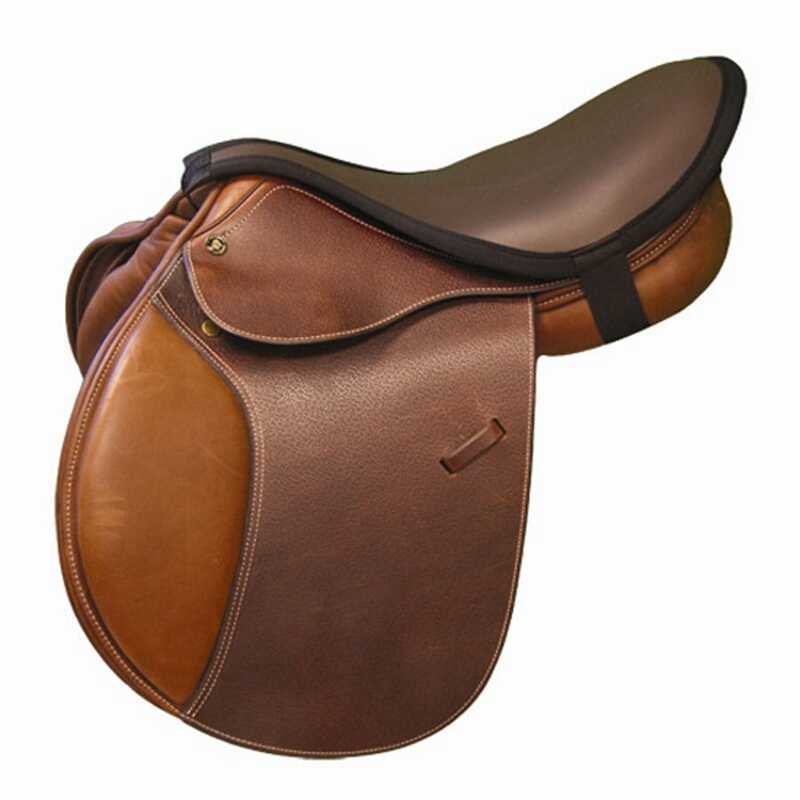 Q if I have a 21" cutback saddleseat saddle which pad would be the correct one? A Thank you for your question! Please measure your seat from pommel to cantle and then across the seat width. There is a sizing tab at the bottom of the page to compare your measurements and choose the best fit. 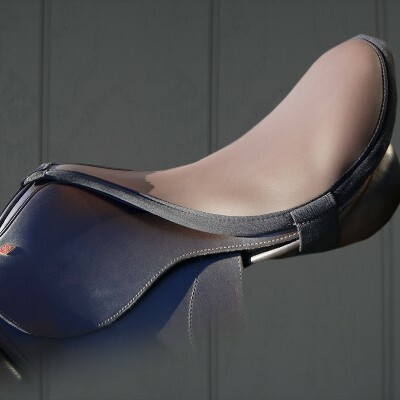 Q Can the western seat saver be attached to an endurance saddle without a horn? A Hi and thank you for your question! We are designing a seat saver for endurance saddles and are currently in the product testing mode! Please email us at info@thinlineglobal for more information and an availability update. Q I'm looking for a seat saver to protect my leather saddle from wear. Is this suitable? Is there any change the seam underneath that contacts the leather saddle seat would damage / rub it? A Thank you for your question! While the seat saver is primarily designed to save your seat with it's shock absorption, cushioning, and seat quieting benefits, it will also help protect your saddle from wear. The binding around the edge of the seat saver is a very soft cotton and hasn't been known to cause any rubbing or damage. Q I am having a hard time with my lady parts and discomfort. Would this help with that issue? A Thanks for your question! This seat saver will definitely provide more comfort, but you may want to look at the way your saddle fits you and the way it positions your pelvis. Different saddle types, twist sizes, seat depth, etc, can all affect the comfort of the rider and it can take some trial and error to find the best fit for you. Q I’ve bought the dressage version and so far like it a lot. However it seems large...not that it seems to move but the strap from pommel to cantle is rather loose...my seat is 17”. Should I have purchased a close contact? A Thanks for your question and so glad you're enjoying your seat saver! The close contact style would likely be too small to adequately cover the seat of your dressage saddle. If it's not moving around, there's really no need to change it. If you'd like the strap to be tighter, you could tie a knot in it to shorten. Please be certain that the knot fits up into the gullet of your saddle and is not touching your horse's back. If you have any other questions, please give us a call at 888-401-9101. Q So if you use this do you not recomend the saddle pad for riders under 255lbs? A Thanks for your question! Our saddle pads and seat savers are for every rider, regardless of weight! The combination of the seat saver and saddle pad is a recommendation for riders over 225 lbs who may not see enough shock absorbing results from using the seat saver alone. 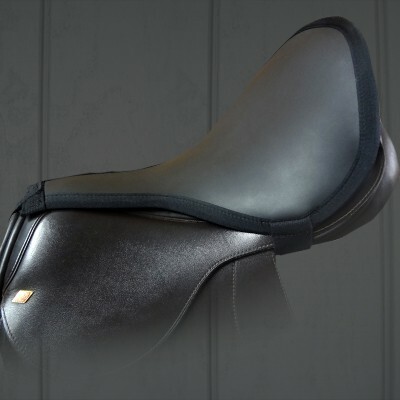 Q Which seat saver do you recommend for an endurance saddle, western style, no saddle horn? A Thank you for your question! Measuring the seat of your saddle and then comparing against the size chart is the easiest way to find the best fit. Be certain to check the measurements of the Game Changer Western Seat Saver also, it may work well for your endurance saddle. Q Can this be returned if not satisfied. A Of course. We're so sure that riders will love these seat savers (and everything else ThinLine! ), that we offer a 30 day satisfaction guarantee! So put it on your saddle and give it a try. Then ride without it and feel the difference! If it doesn't work for you, for any reason, we're happy to take it back and issue a full refund (minus shipping fees). Q Would this be enough cushion for someone who has had lumbar spinal fusion? Thank you. A It is the first product to try. Not only will this absorb shock, but perhaps more importantly for you, it greatly reduces the amount of spinal flexion, movement in the saddle. If it is not enough shock absorption, try adding an Ultra ThinLine pad in addition to the seat saver. Ultra ThinLine has been endorsed by spinal surgeons.